Ernst Krenek's Sonata No. 2, Op. 59 was written in 1928. It represents an early period of the composer's music. Amazing in Yudina's interpretation is her absolute command of the material, a great freedom of improvisation, unpredictability and at the same time a great persuasiveness of her rendering. Yudina is also amazing in her ability to instantly change the inner mood and the nature of extraction of the sound from the instrument. It's an outburst of sensations, powerful energy and the abruptness of the introduction in the first part. Then comes a sweeping manner in the march of the second part. And this goes alongside with deep dreaminess and sudden lyricism. Everything is getting softer and everything thaws out. Yudina plays the Finale with perfect virtuosity and articulation. But there are moments of peace and some classical Beethoven's style harmony in the Finale. Yudina's attitude towards phenomenon of Stravinsky was very special. His grandeur and significance both as a composer and human being was quite evident for her. Stravinsky's snowy summit rises above everybody else, she said. To her, he was a symbol of a truly Russian and at the same time worldwide, universal genius that ought to be by all means returned to Russia. "What a miracle, this man, she wrote. I am learning his Serenada now and enjoy it immensely". Yudina's interpretations of Stravinsky's Serenade in A and Sonata (1924) capture the listeners right from the first sounds. The energy that comes from them is truly great while a non-stoppable rhythmical motion is really magnetic. In Sonata, parts 1 and 3, it's unshakably steady while in Serenade, an introduction, the conclusion of the part 2, and part 3, it's almost spontaneous. The sudden asymmetric accents sound very natural and yet witty. And how beautiful are unexpected stretched caesuras. Two slow parts, Adagietto in Sonata and Romanza in Serenade, appear true masterpieces. The music of both these parts is really exalted, delicate, and sounds like a confession. 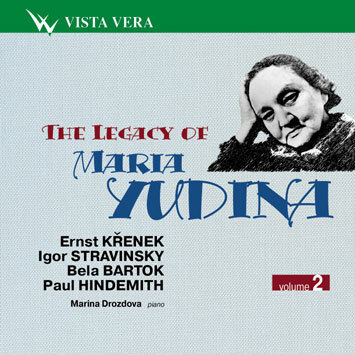 Yudina first turned to the music of Bela Bartok only in 1961. "I did not play him before, because the Hungarian folklore that is alien to me somehow concealed for me his prophetic face. Now I am really overwhelmed by him", she wrote in a letter to Pierre Souvchinsky, an eminent Franco-Russian musicologist. Pieces from Bartok's Mikrokosmos cycle for children (1926 - 1939) under Yudina's hands acquire a scale of extraordinarily profound and inspired poems. The pianist's fantasy is not in the least constrained by the microscopic duration of the small pieces. It's astounding how she makes subtle nuances of dissonance in the melody (major seconds, minor seconds, and sevenths). There's also amazing richness of intonation and colour in her interpretation. Bartok made two versions of his piece No 145 Chromatic Invention. According to the author's directions both of them could be performed simultaneously by two pianos. And this is how it is played on this recording. Yudina was particularly fond of Paul Hindemith whom she first met in 1927 and even played for him. Her repertoire of the last decade of her life included among other things many of the composer's chamber sonatas for piano and various instruments. Yudina was awfully fond of those sonatas and played them with great enthusiasm. As a rule her partners were very young musicians. The author of this article, then a student of the Gnesin's Institute of Music, was very lucky to play Hindemith' Sonata for Two Pianos (1942) with Maria Veniaminovna. It was a great delight to play side by side with her and take part in creating interpretation of this festive music. For some moments I was feeling as if we were a single whole with Maria Veniaminovna. And then my sight and ear became sharp and shining abysses of the wise and high soul of the great musician was opening to me. The interpretation of the Sonata is exceptionally light and clear and full of optimism and inexhaustible energy of her ever-young heart.